A SunMaxx Solar Thermal System won Best In State for 2010 government solar projects. 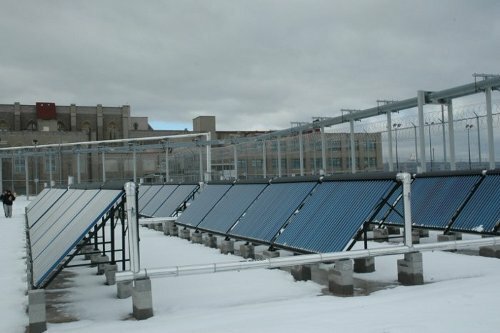 The New York Solar Energy Industries Association (NYSEIA) announced this week that the SunMaxx ThermoPower-VHP30 system (with a total of 1,440 evacuated solar tube collectors) installed at Wallkill Correctional Facility in Wallkill, NY, was the best in its class in design, impact and total reduction in fossil fuel use. The system will average 1.6 million BTU’s per day of free solar energy. The system was designed as a pilot project directive from Commissioner John C. Egan of the New York State Office of General Services (OGS). The OGS is responsible for all public buildings in New York state, which include schools, prisons and government buildings. The hope is to utilize existing solar technology to reduce energy costs at the state level. Customers in the surrounding area that are already using solar thermal energy can take pride in the fact that residential system installations helped SunMaxx illustrate to the OGS the effectiveness of solar thermal in reducing energy costs.